Kids love to make these. It’s such a sticky business! 15 digestive biscuits (crushed) I’ve used up to 17 – it’s not critical! Place the first lot of ingredients in a bowl and mix thoroughly using a wooden spoon. 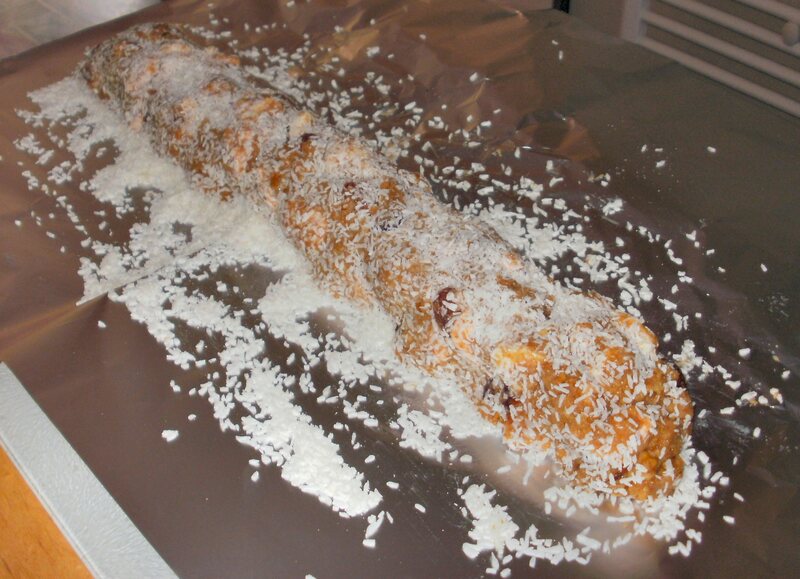 Lay out a long strip (9″ – 1 ft…) of foil or cling film and sprinkle the coconut thickly along its length. Begin to spoon the mixture onto the coconut. You are aiming to make a long sausage shape that you can squeeze together. Make sure it all gets rolled in the coconut. If you want larger biscuits, make the roll shorter and thicker. Pull the edges of the foil of film around the roll and refrigerate overnight or for a few days if you can wait. All you need to do is unwrap and cut rounds from the roll. They can be put in bun papers if you like. Just rewrap the rest of the roll and keep in the fridge.